VoIP has been around for years and the technology has improved exponentially in recent time. At the same time, new ways to harm a business that use and sell VoIP communications are being exploited by malicious individuals. Additionally, VoIP services are at the mercy of the Internet Service Providers (ISP) that in many countries might give an unfair treatment of the connection and data transfer of VoIP for business or political interest. Firewall and the Session Border Controllers are good solutions that protect VoIP communications from many of these threats. These solutions could be very costly for small Internet Telephony Service Providers (ITSP) that do not have the volume and revenue to justify the investment. Because VoIP transmits digitized voice as a stream of data, it is easy to “listen” for VoIP packets. VPN tunneling can prevent this. 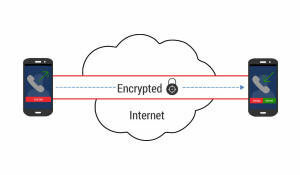 VoIP VPN applies standard data-encryption mechanisms inherently available in the collection of protocols used to implement a VPN. The setup process for VPN differs for each device. So it’s highly recommended to directly configure VPN on Router as said in this article. The VoIP first converts the analog voice signal to digital form, encapsulates the digitized voice within IP packets, then encrypts the digitized voice and finally routes the encrypted voice packets securely through a VPN tunnel. At the other end of the communication, the encrypted voice packets are decoded and converted to a digital voice that is transformed back to an analog signal for delivery to the phone. The advantage of VPN tunneling is that sometimes it is given priority by routers and ISPs, therefore, improving the quality and reliability of the communication. The ISPs will not be aware of the VoIP data and will not throttle the communication.